The April Market Membership meeting has been rescheduled for Monday, April 29th, 6 pm to 8 pm at Second Harvest North Central Food Bank. New members welcome! This is the last chance to join the Market for the 2019 season. 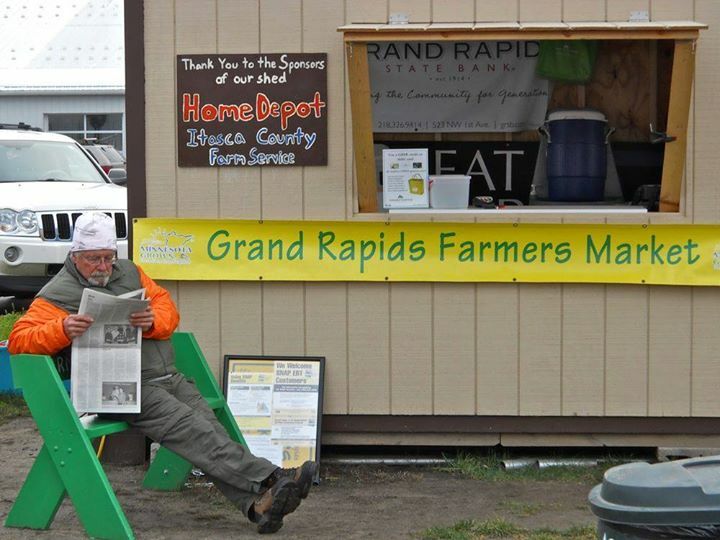 The Market is scheduled to open for the 2019 season on May 8th. You can download the job description by clicking the links above or read the description on the Job Openings page. Locally Grown fresh fruits & vegetables. Home raised meats, Eggs, Honey, Maple Syrup,Jams & Jellies, Fresh Baked Goods, & Canned Goods. Produced by members within 50 miles of Grand Rapids, MN. Shop us on the following days & times. Scheduled to open for the 2019 season on May 8th. The Market accepts SNAP/EBT cards and offers a daily match of up to $20 of GRFM Mighty Dollars & Hunger Solutions’ Market Bucks to extend your benefits to help feed your families. The Market also accepts Credit/Debit cards. We are asking everyone’s help in getting the word out about this great program that helps people eat good healthy food. Grand Rapids Farmers Market – Booth. Use your Credit/Debit or SNAP Cards here. For the latest News and upcoming member meeting notices from the Market Click Here.